This week, the most recent experiment by sunsky (Jaeho Jung). 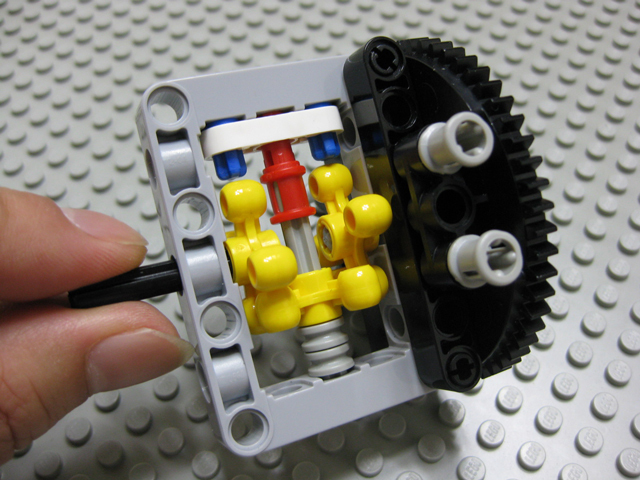 An Heavy Duty Differential (HDD), working like any other off-the-shelf LEGO differential, but made from large and discrete Technic parts. 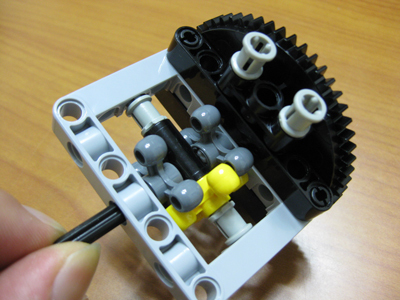 12-tooth gears are used inside LEGO Technic differentials, which may not resist to high torque applications. These gears may easily break-down under load conditions, e.g. when XL motors are directly applied to them, at full power and something blocks the differential body. This setup doesn't use any thin and fragile elements, which makes it a lot more resistant to load applications. Perhaps very large scale vehicles or high speed concept buggies, could benefit from such a large diff. In this setup it is used the top side (or ouside) part, from a disassembled Large Technic Turntable, Type 2. You may find additional photos at sunsky Flickr stream, but guess is already doing something where to apply this. Sunsky made afterwards some modifications to his HDD, trying to achive also something similar to a Limited Slip Differential (LSD) . The first attempt however, had some undesired wearing effects at some parts, which were reduced at the 2nd design. This last one may also have adjustable friction if adding a second of those white 1x3 thin liftarms. Take a look at these, on the photos below. Almost at the same time there was another HDD being developed. This one by Alex Zorko (nicjasno), for his Mustang. Bellow some of his pictures. You may find a lot more, directly from Alex's website (www.nicjasno.com). I found it really brilliant the usage of such old red g9 gears used in Gears Sets from my youth (ya, I'm getting old...) into the transmission attached to this differential, as one solution to increase its robustness for high torque and load stress situations. how easy/safe is it to destroy to turntable for this use? It's both easy and safe, I believe. Sticking a couple of axles in for leverage, I didn't have much difficulty opening it, and the halves popped apart very cleanly. It seems TBs can't post a technique without somebody improving it! LOL, this is a further idea from the same author (sunsky). He aims for Limited Slip Differential. Oh, I know that it's the same author, I just said "somebody" because it isn't uncommon for other people to do it as well. erm, how will you be able to remove the axles from the the 5x7 beam? don't see any difficulty with that. You are making confusion between 75535 and 6538. Take a look at the differentail i'm using for my big models. Posted on www.nicjasno.com. Hi Alex, good to see you here! Jetro called my attention yesterday to your HDD. Actually I've some other posts in hands, but I still plan to update this one, and then will add a reference with some of your photos too (a pity they are not that good, but Ok). I can take more in daylight tomorrow if you'd like. That would be nice Alex. There's not really much to show in the video. It's a differential. It can be seen in action in the last video showing the mustang undewrside with the engine running. New pictures (basically building instructions) are online on nicjasno.com. To whomever it may interest, I've updated this post with further work from Sunsky and Heavy Differential from Alex Zorko (nijasno). Gouess who built Alex teh first turnatble diff... Yes i built it for his mustang, cause the old one was too weak. Nice to see how he improved it. A few days ago, I have uploaded the HDD and some other things on my Brickshelf folder. This brickshelf gallery is a HDD I built. It's too big to be practical for most projects. I designed it when I was trying to use two large PF motors for one drive train in this heavy truck. I'll finish the model with one PF motor...but I've got to figure out how to mod some eLites first to create turn signals that trigger when steering with the PF remote. Some other time I'm going to build an 8x8 truck with 4 large PF motors, 2 on each side, no diffs, using power puller wheels. It will be interesting to see how that works without diffs. 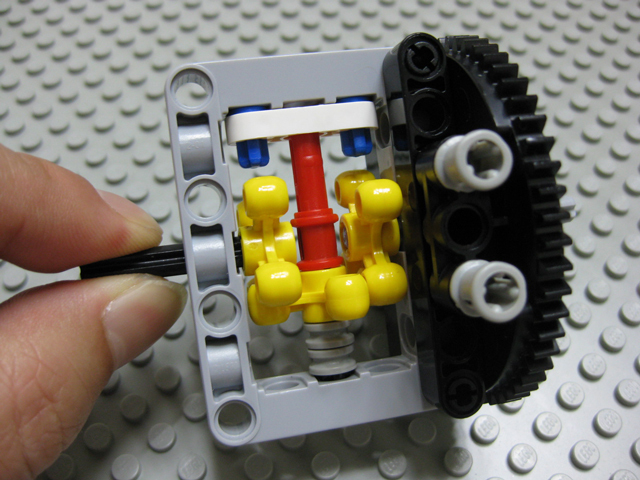 The axles might load up badly when turning, which could twist them. The differential seems very strong, but look closely - it uses a couple of 8t gears. Do you think they would break under load? I saw your HDD. It has the benefit of smaller cross section than mine. But, as you worried, I wonder if the 8 tooth gears can stand high torque such as dual XL motor. How about trying an experiment at the risk of breaking those 8 tooth gears? The weakpoint of your HDD looks like that differential piece and 8 tooth gears. I have used that part for front module chassis here .